Do you know much about weeds? I don’t. Except that I dislike them with a passion. I took a few pictures of my weeds and googled “prickly weeds” to see whether I would find a name for the ugliest of them all. 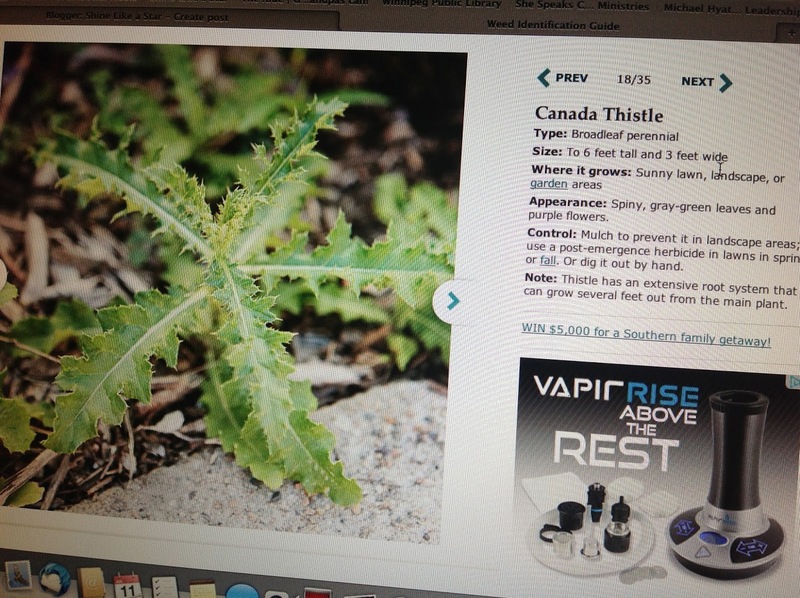 I learned it is a thistle. I couldn’t really determine which one, but it is definitely a thistle that has been invading my garden again and again. And by the way, did you know there is such a thing as smartweed, quickweed, pigweed, chickweed? I wonder who comes up with these names? Yesterday I got my “weeding gloves” out, you know the ones that are so thick you can pull even the prickliest of weeds. I started at one end of my vegetable garden and worked my way to the other end. I arrived at an area that was full of thistles. But at closer inspection I saw that some of them were growing out of the side of a root. There had been a thistle growing before, and I had “pulled” the weed, but only got the tip of the root. That tip had dried up, but the root was not dead. 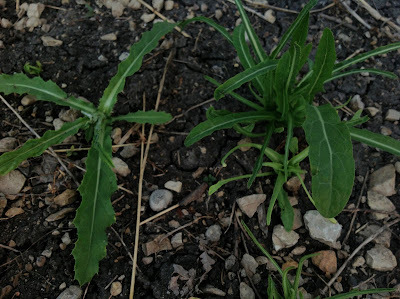 And here is a picture of the same kind of thistle, the one on the left is growing out of the “original” root and the other is growing from the side of a root. I had to think about our lives and the seeds we are sowing and the roots we are growing. When we attack a bad thought, a bad habit and try to remove it, do we take the time and effort to take out the root as well? Did you know the roots of a thistle can be several feet deep? That would involve a lot of digging to get the whole root out. It’s so much easier just to pull on the weed, and it eventually breaks off. We think we have solved the problem because the thistle is no longer visible. But guess what? A few weeks later a nicer looking thistle is growing out of the side of the same root. It has hardly any prickles, and is more pleasing to the eye. you will reap an action. you will reap a habit. 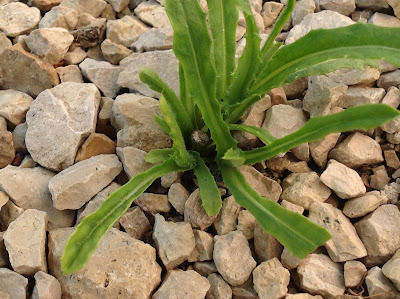 A tiny thistle seed can grow a root that seems indestructible. Let’s not be afraid to dig deep and remove the root. I sure don’t want to be a prickly thistle. Do you? Have You Planned Your Child’s Future? In my personal experience with emotional roots and thistles, it has been worth the pain to dig deeper. The roots were often attached to weeds I had no idea would die when I surrendered to the process. Yes, Lord! He is SO good!